Provide a description of commonly used stimulants in Alabama and their impact on physical and mental health. List evidence based interventions that can be used with agency recipients to minimize risk factors and social determinants that impact access to treatment and recovery. 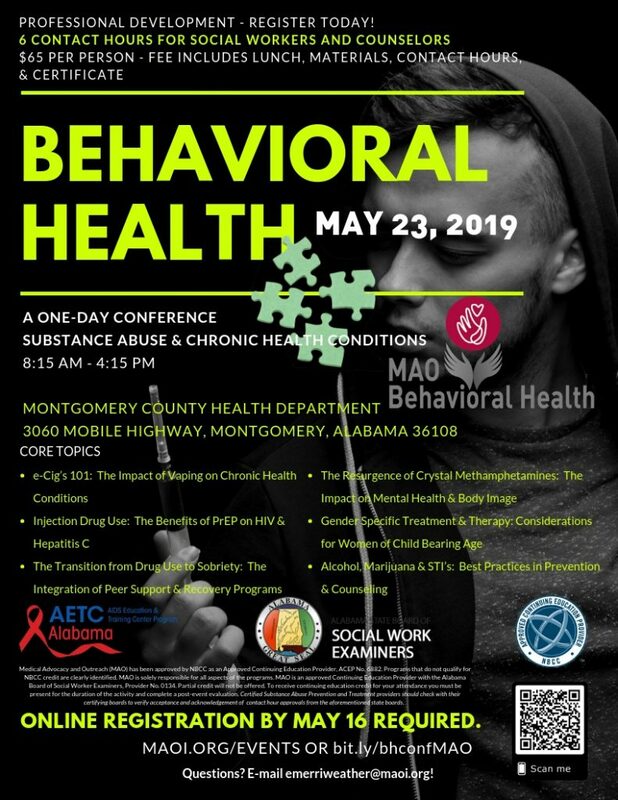 Provide information on treatment criteria and priority groups for substance abuse services in Alabama. Credit Statement (s): Medical Advocacy and Outreach (MAO) has been approved by NBCC as an Approved Continuing Education Provider, ACEP No. 6882. Programs that do not qualify for NBCC credit are clearly identified. MAO is solely responsible for all aspects of the programs. MAO is an approved Continuing Education Provider with the Alabama Board of Social Worker Examiners, Provider No. 0134. Partial credit will not be offered. To receive continuing education credit for your attendance you must be present for the duration of the activity and complete a post-event evaluation. Certified Substance Abuse Prevention and Treatment providers should check with their certifying boards to verify acceptance and acknowledgement of contact hour approvals from the aforementioned state boards. Did you know there were 343 opioid-related overdose deaths in Alabama in 2016? 157 were related to synthetic opioids (mainly fentanyl), 126 were attributed to heroin, and 124 were related to prescription opioids. Opioid use, including injection drugs, can result in direct health risks as well as others. Did you know, in 2015, 9.1 % of new diagnoses of HIV in the United States were attributed to injection drug use?